NEW YORK (CNS) — “Wars are not won by evacuations,” British Prime Minister Winston Churchill famously observed. As writer-director Christopher Nolan’s compelling historical drama “Dunkirk” (Warner Bros.) demonstrates, however, fine films can be made about them. May and June 1940 were indeed, in Mel Brooks’ sarcastic phrase, “Springtime for Hitler.” Using blitzkrieg tactics and a surprise attack through the supposedly impassible Ardennes Forest, his forces rapidly defeated and encircled the British Expeditionary Force and its French allies. Eventually hundreds of thousands of troops were left trapped in a small pocket centered on the English Channel port of the title. Though the Fuhrer called a halt on the land assault and assigned the Luftwaffe the task of finishing off the Allies from the air, the prospects for Britain remained dire. Were the vast bulk of its army to be taken prisoner in France, the outlook for defending against a Nazi invasion of Britain itself would be virtually hopeless. In picking up the story at this point, Nolan takes an Everyman’s view of the situation. Dividing the action into events on land, sea and air, he apportions story lines among an ensemble cast, with sometimes confusing and dramatically diffuse results. Representing the cornered forces on the beach is a trio of ordinary soldiers, Tommy (Fionn Whitehead), Gibson (Aneurin Barnard) and Alex (Harry Styles). Among the few officers portrayed in the film are the senior naval representative on the scene, Cmdr. Bolton (Kenneth Branagh) and his army counterpart, Col. Winnant (James D’Arcy). Embodying the many hundreds of British seafaring civilians who answered the call for fishing and pleasure craft to join in the rescue is small yacht owner Mr. Dawson (Mark Rylance). Dawson is accompanied by his teen son, Peter (Tom Glynn-Carney) and by Peter’s equally youthful friend, George (Barry Keoghan). 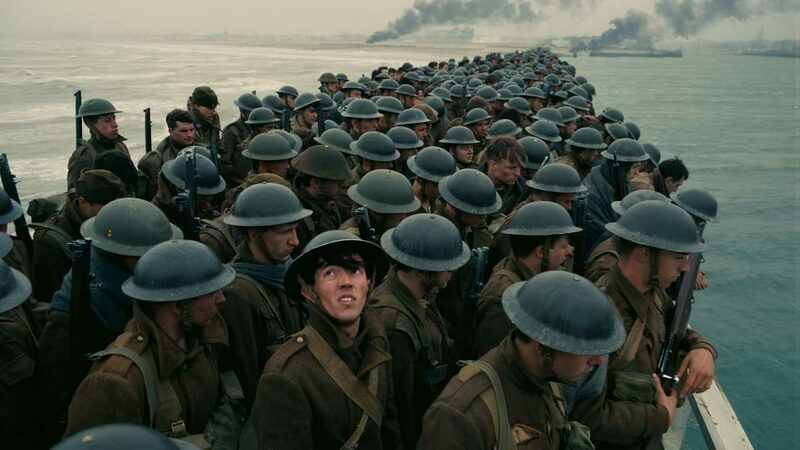 In the middle of the Channel, they rescue an unnamed soldier, played by Cillian Murphy, whose shell-shocked condition and frantic determination not to return, however temporarily, to Dunkirk pose a fresh and distracting challenge for them, with ultimately grim results. Up in the skies, a duo of RAF Spitfire pilots — Collins (Jack Lowden) and his higher-ranking comrade, Farrier (Tom Hardy) — battle the German fighters and bombers seeking to wreak havoc on both the hapless soldiers and the shipping below. The perils of the desperate, against-the-odds operation are fully exploited for dramatic tension, with near-death experiences awaiting almost every character. The measures resorted to by some of them in their efforts to survive seem questionable — at least as viewed from a comfortable theater seat. Yet these ethical lapses are balanced by a general sense of heroic pluck and by incidents in which humane justice and generosity of spirit are upheld. The altruism motivating Dawson and others to risk life and limb for the sake of strangers also elevates the moral tone. While “Dunkirk” is not for the fainthearted of any age, the movie’s educational value and relative freedom from objectionable content makes it probably acceptable for older teens. The film contains intense stylized combat violence, brief gore, a couple of uses of profanity and at least one instance each of rough, crude and crass language. The Catholic News Service classification is A-III — adults. The Motion Picture Association of America rating is PG-13 — parents strongly cautioned. Some material may be inappropriate for children under 13.